Preese Hall was the ancient seat of the Prees family. On the death of Margery de Prees, about 1401, it passed to her nephew, Edmund Skillicorne and it remained in the Skillicorne family until about 1612 when the manor was sold. A deed of 1641 mentions the farm buildings: "Wheate barne, the Stable, the Greate Barne, & the Barlie Barne", also the closes: "Cookes Greene (7acres), Cowe Hey (17acres 3roods 30 falls), Wheatfeilde (16a), RoughHey (10a), Owe-buts, Newe Medowe & Horse Heyes (25a2r30f), 3 Burned Carres (11a3r26f), Greate Carr (14a2r), Chappell Flatt (12a24f), Stack-hill & Cunnery (1a3r), 4 acres of moss called the Northside Mosse." A deed of 1653 mentions the hall: "the ground parlor in the west end, the lower Closett on the south of the ground parlor, the chamber over the ground parlor, the upper closett over the lower closett, the ould house adjoining the ground parlor, the garden adjoining the south side of the ground parlor & lower closett." The same document also mentions closes called: "the Create Holme, West Granes, Drywood, Little Calfe Croft, Greate Carre Meadowe, Bambers Carre, Oxehey Meadowe, & the Little Holme." The farmlands were quite extensive; by the early 1700s they were being leased out to three tenant farmers. The hall must have been a fair size as it was divided into three parts for the families of the three tenants. 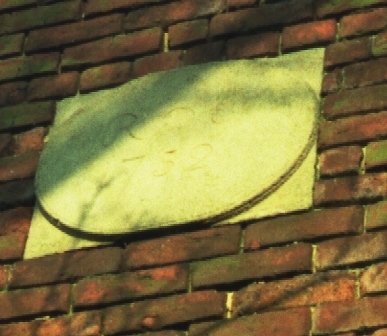 In 1707 these tenants were Edward Jolly of Mithop, Edward Rainford & Thomas Wilkinson. With so many people living there its perhaps not surprising that there was a fire in 1732 which destroyed parts of the hall, including the private chapel. 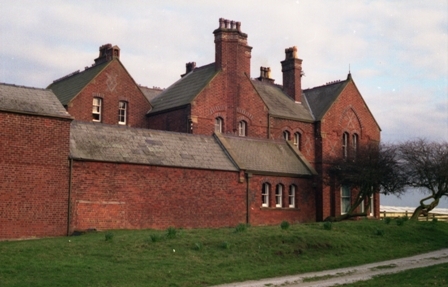 What was left of the hall was susequently repaired and the building remained in use until 1864. 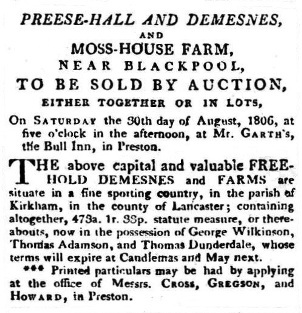 Advert for the sale of Preese Hall Farm, Weeton, and Moss House Farm, 1806. 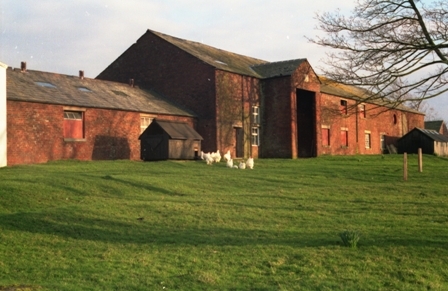 These two farms (now either side of the M55) were close to each other and were being leased to three farmers; George Wilkinson, Thomas Adamson and Thomas Dugdale. 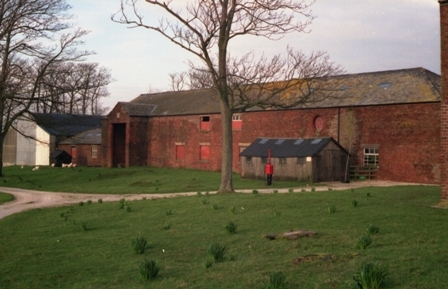 In the 1830s Preese Hall was farmed by a single tenant, Robert Thornton (1772-1841). 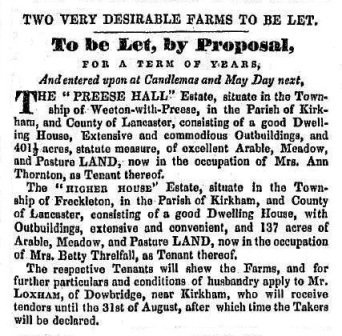 Advert for the lease of Preese Hall Farm, Weeton, and Higher House Estate, Freckleton, 1842. In the 1840s & early 1850s Preese Hall was farmed by Thomas Bilsborrow. About 1853, Thomas Miller purchased Preese Hall from the trustees of the late Mr Hornby of Ribby. After the tenant's lease expired, Miller set about making considerable improvements to the estate. 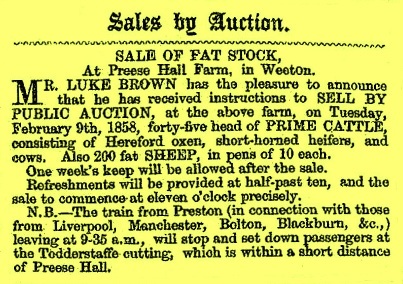 Advert for the Sale of Fat Stock at preese Hall Farm, 9th February 1858. The sale included 45 head of prime cattle, consisting of Hereford oxen, short-haired heifers, and cows; also 200 sheep. 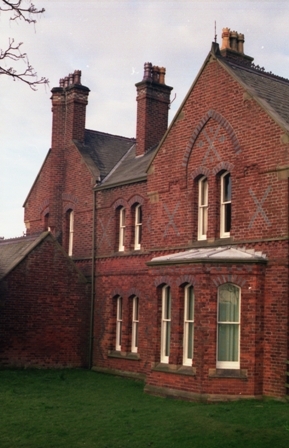 The railway passed by Preese Hall & Todderstaffe Hall and the railway company was planning the construction of a siding in the area for the use of local farmers. Until then farmers would alight from trains at the nearby Todderstaffe Cutting. About twelve o'clock on Thursday night last, or early on Friday morning, a fire was discovered to be raging amongst the stacks on the premises at Preese Hall, in the township of Weeton-with-Preese, in the occupation of the owner, Thomas Miller, Esq., of Preston. Three hay stacks (two old and one new) were totally destroyed, and an old oat stack, containing about 90 thraves of last year's growth, was, with the exception of about 6 thraves, likewise destroyed. The entire damage is estimated at about £200. The origin of the fire is at present unknown. Thomas Whiteside, alias "Tearing Tom," and Thomas Shenty, two notorious poachers, were taken by Thomas Hogarth and his assistant, John Bonny, on Thursday night last, on the Preese Hall estate, in the act of netting hares, Whiteside having one in the net at the time. The other had a net in his hand at some distance. Whiteside, in his defence, in a very energetic manner asked the keeper if he knew whether the animal in the not was a hare or a cat.The Bench committed both to the House of Correction, with hard labour, for six calendar months. As Shenty was leaving the court, be told the Bench that he had got 1,200 hares this season ; that he was going away for six months, and in one month after that he would have 1,200 more. It is said that "Tearing Tom" has had his Christmas dinner at the House of Correction for twenty-one years in succession, and there is every prospect of his having another. "Like the Singleton, Hardhorn, and other property of Mr. Miller, in the Fylde, it has been so changed by the judicious and enterprising course of improvement which that gentleman and his agent, Mr. Fair, of Lytham, have carried on, that anyone who had inspected the farm before it came into Mr, Miller's possession would certainly not now recognise it." When Mr. Miller took Preese Hall Farm into his own hands it was undoubtedly one of that class of farms which rendered Lancashire amenable to the complaint of Sir James Turner, during the Civil Wars. He recommended the march of the Parliamentary forces southward ,through Yorkshire instead of Lancashire, because this county " was full of ditches and hedges." The Preese Hall farm was split up into 45 fields, divided by wide spreading hedges and broad ditches. One ditch, a catch water draw from the high portion of the estate was actually in some places eleven yards wide! Ditches were drained and filled up, and the number of fields reduced to 16, so that the cultivatable area of the farm was considerably enlarged. Six of these fields, averaging about 30 acres each, were laid out for cultivation on the alternate system of husbandry, (three years in tillage, and three years in grass) there were five fields of carr or moss land, containing an aggregate of 90 acres, four of the fields being cultivated on the four-course system, and one, which was irrigated, was permanent meadow. The rest of the farm, five large fields, was permanent meadow and pasture land. 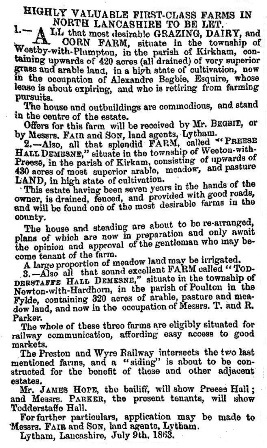 Advert for the lease of a Dairy & Corn Farm at Westby-with-Plumpton, Kirkham; Preese Hall Farm, Weeton; and Todderstaffe Hall, Newton-with-Hardhorn, 1863. The first two farms had been leased to Alexander Begbie but the lease was about to expire and he was retiring from farming. Mr. Butler, butcher & grazier, of Manchester took over the lease. 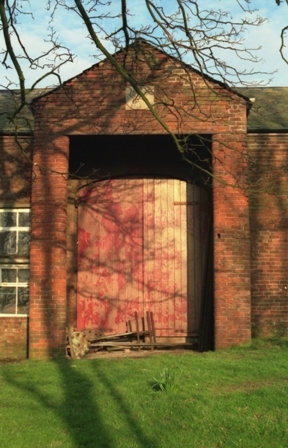 At this point in time the old Preese Hall was about to be demolished and plans for the new hall farm were ready and awaiting approval of the new tenant. 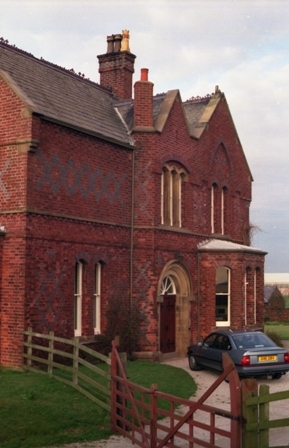 Todderstaffe Hall was being leased by T & R Parker at this time. In September 1863, a steam plough was tested at Preese Hall Farm. It was a huge event attracting several hundred people. To view the original newspaper report click here. The farmhouse at Preese Hall Farm, rebuilt c1864. The original Preese Hall probably stood near Preese Hall Cottages. Some workmen, whilst employed in emptying a number of guano bags, on Saturday last, at Preese Hall Farm, in Weeton, which belongs to T. Miller, Esq., of Preston, and is tenanted by Mr. Butler, made a very strange discovery. The guano had come from Liverpool, to which port it had been shipped from Peru, and after a number of bags containing it had been emptied, one of the men observed a human hand amongst the manure ; it had just rolled out of one of the sacks. On being picked up the hand was found to be in a wonderful state of preservation. The hand was full-grown, and the flesh, muscles, skin, &c., seemed to be quite perfect ; but after it had been exposed to the atmosphere for a short time decomposition set in rapidly. Two or three days after some more bags of guano were being emptied, at the same farm, when, strange to say, a human foot, of the full size, but with some of the toes detached, dropped out of one of them. Like the hand, it was in a good state of preservation. It was a left foot and had been severed from the base of the ankle. No one can account for the hand and foot being amongst the guano. The Preston Guardian, Saturday, 1st April, 1865. If anyone can help with information or pictures relating to Preese Hall Farm then please email.